With the recent yo-yoing of prices at the gas pump, you might be wondering – do gas prices have any effect on the price I pay for propane? Can I expect to pay less for propane since I’m paying less at the pump? The price of crude oil gets a lot of attention in the news, especially as it relates to gas prices. When the cost-per-barrel drops, we can expect the price at the pump to drop a few cents eventually.We all celebrate a little when the price at the pump drops a few cents. But does the price of crude oil affect the cost of propane? Propane is a byproduct of crude oil and natural gas processing, but the larger portion of propane produced comes from the crude oil refineries. Propane competes with other crude oil-based fuels, and the price of crude oil has a larger influence on the price of propane than that of natural gas. You remember learning the supply-and-demand rule in school, and this rule hasn’t changed over the years. For any commodity, the demand, balanced against available supply, affects the cost of that commodity. This is especially apparent for propane when winter is long, cold, and harsh. Other factors that affect supplies are production and inventory levels, and the timing of the demand on available propane will affect pricing. Many recall the winter of 2013-14 as exceptionally cold and lengthy. Propane prices spiked as the cold weather dragged on toward what would typically be called spring, mostly because supplies of propane were running low. Weather can also affect costs if it slows production, creating a lower supply to draw from. The closer you live to a main distribution point for propane, the less on average your cost will be. 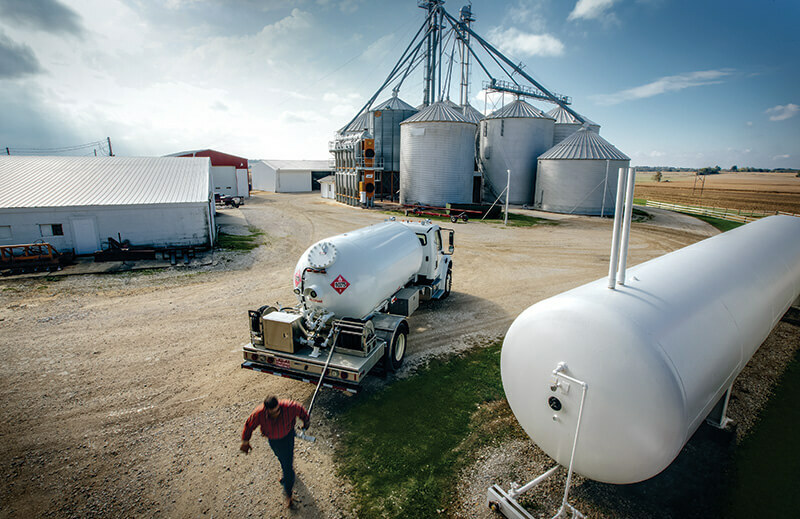 Delivery of propane from refineries can take a lengthy route to its destination at the consumer end, and transport and storage costs also affect the overall cost of propane. Obviously, winter is when propane use tends to spike for residential customers, and it is this market need that also influences propane costs. Going back to the supply-and-demand formula, the demand balanced against the supply means that customers will pay consistently higher prices for propane when they need it most. Conversely, industry use of propane tends to rise and peak in the warmer months, when propane-fueled vehicles and machinery are more in demand. Why do propane prices spike? Propane is produced by refineries and gas processing plants at a fairly steady rate year-round, which means that there is no ready source of increased production when supplies run low. Spikes in price are typically due to a dwindling supply, which drives up costs for both wholesalers and retailers. Imported supplies of propane do not do anything to alleviate price spikes because of the expense involved in delivery. When demand runs high and supplies run low, spikes in price affect everyone from the wholesaler to the retailer to the consumer. The surest way to keep your propane budget in line is to arrange for automatic delivery at the start of your propane contract each year. Lin-Gas offers an EZ Pay program that locks in your price for a full year, and sets regular deliveries based on your usage history. This three-level program allows customers who have been with Lin-Gas for one year or longer to rely on regular deliveries at a fixed price in an 11-month period. In the twelfth month of the program’s contract, any differences in price will be settled, resulting in either an additional cost or a credit to the customers’ account. The basic level of the program, EZ Pay Silver, establishes a fixed rate per gallon, allows you to still receive paper invoices, and requires payment by the fifteenth of each month. The next level of the program, EZ Pay Gold, establishes a cap price per gallon to be paid, delivers invoices electronically, and requires an auto debit from your bank account each month. The premier level of the program, EZ Pay Platinum, establishes a fixed price per gallon and also delivers invoices electronically and requires an auto debit from your bank account each month. At each level, adjustments are made in the twelfth month and the program renews for another 12-month period. By setting up your propane costs and delivery well in advance of the cold weather months, you’ll be warm and toasty – and price protected – even if winter overstays its welcome. Want to know more about the Lin-Gas EZ Pay program? Contact us!